AKG headphones have combined excellent sound quality with fashionable design to create a range of headphones that suit any needs. The different models offer something for everyone, with varying prices, features and designs. If you’re looking for comfortable in ear headphones then the AKG Y23U, which comes in red, teal or white, is a great choice. Compatible with all smartphones, and featuring a microphone and remote, answering calls or switching between songs on the go is effortless. 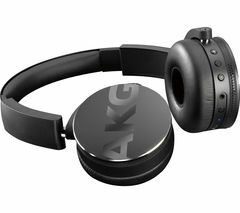 If you’re in the market for an on ear set, as opposed to in ear, then AKG headphones offer a good range of sturdy and practical options. The mid-range models often come in a variety of colours, and are foldable for easy and safe storage. If you’re looking for ultimate ease of use and comfort then you’ll find the wireless Bluetooth AKG headphones do the business. At just 155g they’re super lightweight so as not to weigh you down on the move, and come with faux leather padding to keep you comfortable during extended periods of use. So whether you’re in the market for an in ear, on ear, or Bluetooth pair, AKG headphones offer great value along with comfortable products and excellent sound quality.